Mercedes-Benz There are 136 products. Top Hydraulics is the world's leading rebuilder of convertible top hydraulics - Top Hydraulics' quality is unmatched, far better than on brand new parts! If we couldn't make the parts better, then we wouldn't bother working on them. We rebuild cylinders, we manufacture new hoses, and we rebuild convertible top (and lift gate) pumps. 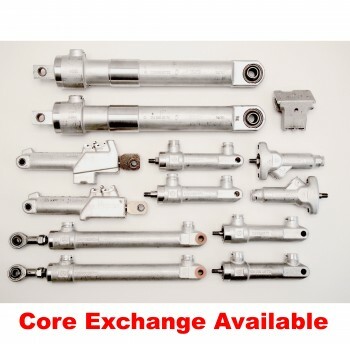 We offer core exchange (where we ship parts from our inventory first, then you send back your original parts to recover your deposit) on most convertible top hydraulic cylinders and pumps, and we can even take care of unusual problems such as flood or fire victims. Rebuild/Upgrade Service for convertible top hydraulic components on Mercedes R129 models 280SL, 300SL, 500SL, 600SL, SL320, SL500, SL60, SL600, SL73. We have two order methods: Either you send in your cylinders first, or choose to "Order now with Core Exchange". Model years 1990-1996 have twelve hydraulic cylinders, while 1997-2002 models have eleven hydraulic cylinders that move and lock the roadster soft top. (The left tonneau cover lock was omitted after 1996.) The original seals in the hydraulic cylinders, aka rams or actuators, will eventually fail in every R129, unless it gets wrecked prematurely, even if you never drive the car or have never used the top before. Rebuilding these cylinders is NOT a matter of changing o-rings. Every R129 cylinder has one o-ring, and those rarely ever fail. What fails most frequently, are the other seals, which have special shapes for proper function. 4) Port seals. They seal the hydraulic lines where they are pushed into the cylinders. Port seal failure is becoming more and more common as the R129s age. It also applies to the front distributor p/n 1298000022. Port seals have a special shape that makes them seal under pressure. O-rings wouldn't do the trick. They are secured by precisely machined brass rings (accuracy about 1/100 mm). DIY removal of the brass rings will almost certainly destroy the brass rings. Top Hydraulics installs port seals that are tighter than the originals, just in case the hydraulic line fittings have been scratched. 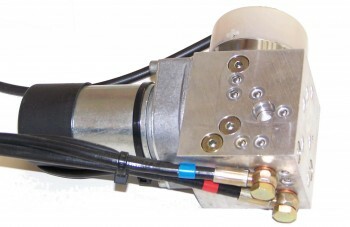 Cylinders and distributors upgraded by Top Hydraulics should easily outlast your car! SLK200, SLK 230, SLK230 Kompressor, SLK320, SLK32 AMG. Typically requires 5 rams with hydraulic lines for complete upgrade of convertible hard top lifting system. 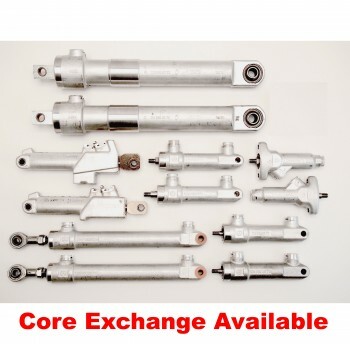 We have two order methods: rebuilding the cylinder(s) you send in, or sending you a complete set up-front from our stock (slightly higher charge, plus a refundable core deposit apply). The seals in ALL these cylinders fail with time. 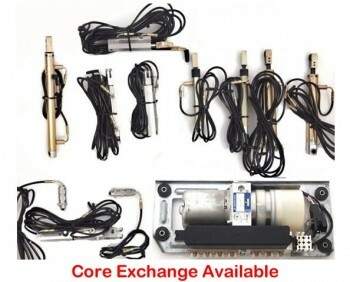 If you live in a hot climate and you have noticed a hydraulic leak, then having Top Hydraulics upgrade all cylinders and the pump at the same time is the best choice - you will have to deal with the hydraulics only once, you save a lot of labor in the end, and the convertible top hydraulic system will outlast your car. The R231's hydraulic pump aka hydraulic unit is a complex, high-performance pump with integrated valve block, two different output pressures, high-end electronic noise suppression, and high flow rate. 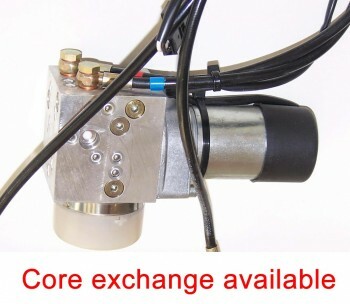 The upgrade service for your hydraulic top pump replaces heat sensitive parts inside the pump with re-designed, precision machined aluminum ones, improves fluid filtering, services the valve block, solenoids and check valves, upgrades electronic components, upgrades internal seals, and replaces the electric motors if needed. 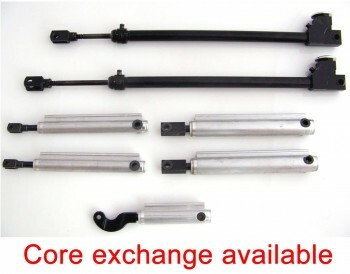 For Rebuilding Your Cylinders: You must send your convertible hydraulic top cylinders to us. Once we receive your cylinders, the turn around time is up to two business days for rebuild service and we will ship the cylinders back to you by Priority U.S. Mail (2-3 days delivery time). Core exchange service is now available for full sets of eight cylinders, as well as some single cylinders based on availability. Core exchange is NOT available for individual p/n's 1248000072, 1248000373, or 1248000472. Model years 93-95 have eight hydraulic cylinders that move and lock the convertible soft top. The original seals in the hydraulic cylinders, aka rams or actuators, will eventually fail in every W124, unless it gets wrecked prematurely, even if you never drive the car or have never used the top before. Rebuilding these cylinders is NOT a matter of changing o-rings. Every W124 cylinder has one o-ring, and those rarely ever fail. What fails most frequently, are the other seals, which have special shapes for proper function. 4) Port seals. They seal the hydraulic lines where they are pushed into the cylinders. Port seal failure is becoming more and more common as the W124s age. Port seals have a special shape that makes them seal under pressure. O-rings wouldn't do the trick. They are secured by precisely machined brass rings (accuracy about 1/100 mm). DIY removal of the brass rings will almost certainly destroy the brass rings. Top Hydraulics installs port seals that are tighter than the originals, just in case the hydraulic line fittings have been scratched. 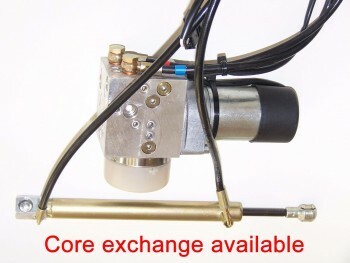 Top Hydraulics is proud to offer core exchange for ML lift gate pumps. Core exchange means we send you a pump from our inventory first, then you send back your original one (known as the core) to recover the full deposit if the pump can be rebuilt (which they almost always can) and you sent us back all parts.The pump ships filled with fluid and with new crush washers for the hydraulic lines, which makes pump replacement plug-and-play for you! Most pumps fail when they accidentally get exposed to too much moisture. The rebuild service of the electrical portion of your pump can entail replacing the electric motor, replacing the solenoid, rebuilding the motor, rebuilding the solenoid, replacing the wiring harness, repairing the wiring harness, or a combination of the above. In most cases, the electric motor gets fully disassembled, the housing gets sandblasted, and protected with several paint layers. Further to electrical issues, Top Hydraulics will always rebuild the pump by replacing internal seals, replacing rotor and pistons if necessary, replacing or rebuilding internal check valves, and putting the finished product through an extensive test to ensure that you get back a pump that performs better than a brand new one. A simple description about any competitors that we have seen so far, trying to "invade" the pump rebuild market: there is no comparison to our product. We do the job right, and we ship products of which we are convinced that they are better than brand new ones. We don't supply make-shift solutions that may make the pump survive a short warranty period, but we implement solid improvements to the pumps. For example, we mold our own oil seals (between the electric motor and the pump - much like the rear main seal of an engine) in an improved shape (compared to OEM seals) that will allow more back pressure from the pump and last longer. Unless our rebuilt pumps get badly abused, they should outlast your car! The W208 CLK-Class convertibles have seven hydraulic cylinders for convertible top actuation and latching. The two aluminum latching cylinders 1298001672 and 1298000072 are usually the first ones to fail, and should be upgraded at the same time. The five black lift cylinders 2088000x72 usually follow as a second stage. We upgrade your 2088000x72 cylinder(s) by replacing the tiny OEM rod seal with a much larger one made of superior material, and adding custom caps made of CNC machined stainless steel to accommodate these superior seals. Our seals are not sensitive to water and are resistant to most additives in hydraulic fluid. 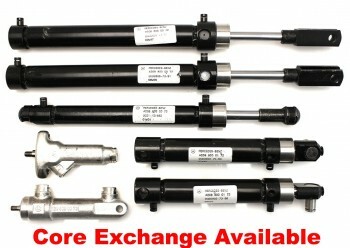 This results in a much longer service life than the standard OEM cylinders, for a fraction of the price. 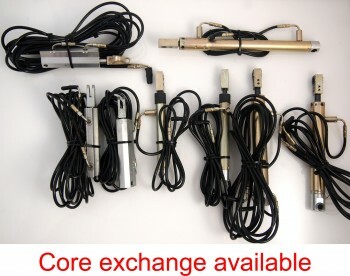 Our Core Exchange option makes this as easy as buying a new cylinder - you only have to ship back your old cylinder(s) afterwards for core credit. 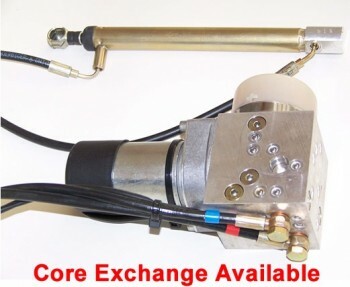 Core Exchange is available for single CLK cylinders, locking cylinders already mounted in replacement latches, or full sets of cylinders. For standard rebuild service, you remove your cylinders you would like to have rebuilt/upgraded, using the best seals available, and send them to us. Once we receive your cylinders, the turn around time for W208 CLK-Class cylinders is about two days for rebuild service and we will ship the cylinders back to you by Priority U.S. Mail (2-3 days transit time in the US). W220 S-Class 2000-2006 : S320 CDI, S320, S430, S500, S600, S55 AMGRebuild/Upgrade service for trunk power opening/closing hydraulic system. 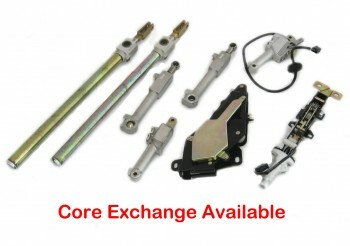 Rebuild & Upgrade Service for your 2006-2013 W221 S-Class Hydraulic Liftgate components. Top Hydraulics rebuilds the tiny valves and distributors for the Grans 600 Pullman Limousine's central hydraulic system, and makes them better than brand new ones. We use the same seal shapes with edge-seal technology, but we use more modern and yet longer lasting materials. 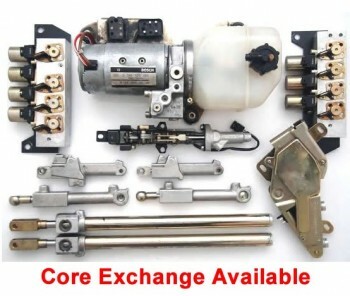 Send in your parts for rebuild - there is no core exchange program. The rebuild service includes replacement and upgrade of all internal seals.